Halloween stores do carry some great products, but you just can’t beat Halloween decor ideas that you’ve whipped up yourself. 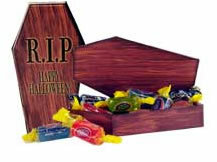 If you have a Halloween decor idea of your own and would like to have it featured on 365 Halloween, please contact us. Whether it’s or a simple twist on store bought decor, a complex “Bucky” skeleton prop, or a totally unique idea of your own creation, please share!